"It wasn't every day that a man discovered himself to be the hero of a virgin's secret diary." "It would be the height of dishonorableness to continue reading." "She could burn the diary now and cast the earl entirely from her thoughts. Or for a few more weeks she could enjoy his company..."
I read a lot of Regency romance and although I try to avoid it, I often notice the similarity between plot lines; it's almost inevitable given the structure of the genre. However, I was surprised and pleased to note that "Kisses, She Wrote: A Christmas Romance" is adorably original. Ms. Ashe's writing is wonderful; the 176 pages turned themselves and I was lost - as any reader should be - in this timeless love story. Well done! In my almost five years of reviewing and recommending to friends, family and readers here, there have been a few times, and only a few, when I have been completely and totally blown away by a book that I've read. This usually happens when there is a happy confluence of subject matter, writing prowess, research skill and character development, wrapped up in a believable, action filled story. If you haven't already guessed, The Lost Duchess, by Jenny Barden, is one of those books. This second effort by Ms. Barden begins with the story of Emme Fifield, a lady-in-waiting to Queen Elizabeth I, who yearns to throw off the mantle of Court and live a normal life; one where marriage and children are a possibility without the Queen's interference. When her trust and naivety is brutally savaged by the erstwhile heir to the Duke of Somerset, she sees her only opportunity to forge a new life lies in joining an expedition to the Chesapeake, in the New World. She convinces the Palace to allow her to go, with the understanding that she will return with a full report on the new Colony's progress. Christopher Doonan is an experienced mariner with a colorful and painful past. Taken by the Spanish and held in Mexico as a young man, he is sold into slavery. Rescued by Cimaroons, he becomes the leader of a pack of outlaws in Panama. When word comes to him of an English ship, he is reunited with his brother, a member of the crew, and makes his way back to England, a changed man. Drawn to the sea, he returns to the New World with Sir Francis Drake, where he acquires a page named Rob, who becomes his constant companion. "Kit" is once again set to return to the New World, as boatswain on a ship scheduled to leave England, but this time he will choose to remain as a permanent settler, for reasons he cannot yet divulge. Kit and Emme meet at one of the Queen's audiences to fete the accomplishments of Sir Francis, and to discuss the recent and future expedition. Kit is entranced by Emme, but while Emme certainly notices him, she is intent on the seed of the plan that has already taken root in her mind. Those familiar with American history and the nascent English settlement of the Colonies in the late 1500's know the story of the Lost Colony at Roanoke, whose original destination was actually the Chesapeake Bay area. There is no record of what happened to the 116 men, women and children who established that colony in 1587. However, Ms. Barden has an incredible knack for weaving fiction with fact. The story of the settlement is told through her characters, and the ending is one plausible explanation for what happened. She's done her research and it most definitely shows. Descriptive passages are everywhere. Ms. Barden makes it very easy to imagine Emme's life at Court, the ocean voyage, the sights and sounds of the New World and the settlement itself. The love story between Kit and Emme serves a dual purpose. The connection between them is sweet and beautifully written, and serves as a way to possibly define this novel as a historical romance. However, most historical romances highlight the characters' relationship, with the setting and time period secondary and as a means to an end. In fact, the setting of these novels are virtually interchangeable as long as the protagonists are together on the last page. Ms. Barden, conversely, uses her characters to highlight the setting and makes that the focal point of the story. What happens to them and where it happens is as important as who they are to each other. This is what makes this novel so very good. The last few chapters are suspenseful, dramatic, and satisfying in their resolution. It's at this point that the pages practically turned by themselves. Revelations come fast and furious; love and life are affirmed between father and son, friends, and lovers. I did not want it to end. Please note: Out on November 7, 2013 from Ebury Press, intially it will be available from Amazon.co.uk in Kindle and hardcover, The Book Depository in hardcover and at bookstores everywhere except North America. I will post on our facebook page as that availability changes. 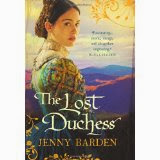 The Lost Duchess, by Jenny Barden is highly recommended, and one of the best books I've read this year.